Yes, I KNOW that yesterday Belinda and I both were encouraging you as an expat moving to London not to hide within the comforts of home, to branch out and embrace your new community. That said, sometimes people relocating to London from the U.S. just need that fix of good ol’ Americana. You see the tremendous sports fandom here for UK sports like football (soccer), rugby, and cricket, which is a fun quasi-familiarity that may make you pine for your own days of face-painting and cheering your fool head off in the stands. Or on your sofa. Be a good sport (pun fully intended) and try watching these local faves; learn their rules and attend a live match now and then. You might grow to love it yourself, or, at the very least, will satiate that sports craving in part…just to get by…at least for a little while…No? This is not flying for you? Super Bowl XLV getting a little close to be messing around? Local pubs likely to show American sports (Super Bowl, too–but check their websites to confirm that) are The Sports Cafe (Haymarket), Bodean’s (with BBQ restaurant locations in Soho, Clapham, Fulham, and Tower Hill), Texas Embassy Cantina (near Trafalgar Square), Henry J Beans (Chelsea), Famous 3 Kings (West Kensington), and Maple Leaf (Covent Garden—I’m not positive about football, but definitely hockey at this Canadian bar). 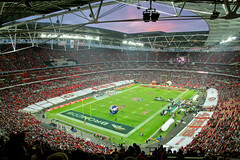 And you’ll have best luck keeping track of the Super Bowl in London scene at the NFL UK site, which will also update you on when the next annual NFL game is played right here in Wembley Stadium! If you’d like to avoid the crowd or overall sports bar atmosphere and drink beer cheaper at your apartment :), ESPN America broadcasts American sports over here if you subscribe to Sky, Virgin Media, or TalkTalk TV. Of my friends who subscribe to the above, the NFL Game Pass is by far their favorite, allowing you to watch up to four games at one time if you want. They’re all pay subscriptions, sometimes by week, month or season. Payoffs/cups/bowls are usually separate packages. So moving to London means embracing a new life, but you don’t have to check it all at the door, sports fans! Wanting to see a home run doesn’t mean you’re running home ;).